Posted by TheChamp on Sep 14th, 2011 and filed under Champions, Golf. You can follow any responses to this entry through the RSS 2.0. Both comments and pings are currently closed. Eldrick Tont "Tiger" Woods (born December 30, 1975) is an American professional golfer. He is considered one of the greatest golfers of all time, ranking second in both major championships and PGA Tour wins, as well as holding numerous records in golf. The next decade of Woods' career was marked by multiple comebacks from both personal problems and injuries. He took a self-imposed hiatus from professional golf from December 2009 to early April 2010 in an attempt to resolve marital issues with his estranged wife Elin. The couple eventually divorced, with his many alleged extramarital indiscretions being revealed by several women through worldwide media sources. Woods fell to number 58 in the world rankings in November 2011, before ascending to once again reach the No.1 ranking between March 2013 and May 2014. However, Woods' personal problems persisted outside of golf, alongside injuries which led to him undergoing four back surgeries in 2014, 2015 and 2017. He competed in only one tournament between August 2015 and January 2018, dropping out of the world's top 1000 golfers. On his return to regular competition, Woods made steady progress to the top of the game, winning his first tournament in five years at the Tour Championship in September 2018 and his first major in eleven years at the 2019 Masters. Woods has broken numerous golf records. He has been World Number One for the most consecutive weeks and for the greatest total number of weeks of any golfer. He has been awarded PGA Player of the Year a record eleven times and has won the Byron Nelson Award for lowest adjusted scoring average a record eight times. Woods has the record of leading the money list in ten different seasons. He has won 15 professional major golf championships (trailing only Jack Nicklaus, who leads with 18) and 81 PGA Tour events (second all time behind Sam Snead, who won 82). Woods leads all active golfers in career major wins and career PGA Tour wins. He is the youngest player to achieve the career Grand Slam, and is only the second golfer (after Nicklaus) to have achieved a career Grand Slam three times. Woods has won 18 World Golf Championships. Woods was born in 1975 in Cypress, California, to Earl and Kultida "Tida" Woods. He is their only child and has two half-brothers, Earl Jr. and Kevin, as well as a half-sister named Royce from his father's first marriage. Kultida (née Punsawad) is originally from Thailand, where Earl had met her on a tour of duty in 1968. She is of mixed Thai, Chinese, and Dutch ancestry. Earl was a retired lieutenant colonel and Vietnam War veteran who was mostly African American with traces of European descent. Earl's mother Maude Carter was light skinned. Some people suggested that she had Native American and Chinese ancestry. Tiger refers to his ethnic make-up as "Cablinasian" (a syllabic abbreviation he coined from Caucasian, Black, American Indian, and Asian). Woods' first name—Eldrick—was coined by his mother because it began with "E" (for Earl) and ended with "K" (for Kultida). His middle name Tont is a traditional Thai name. He was nicknamed Tiger in honor of his father's friend Col. Vuong Dang Phong, who had also been known as Tiger. Woods' niece, Cheyenne Woods, played for the Wake Forest University golf team and turned professional in 2012, when she made her pro debut in the LPGA Championship. Woods grew up in Orange County, California. He was a child prodigy who was introduced to golf before the age of two by his athletic father, Earl Woods. Earl was a single-digit handicap amateur golfer who also was one of the earliest African-American college baseball players at Kansas State University. Tiger's father was a member of the military and had playing privileges at the Navy golf course beside the Joint Forces Training Base in Los Alamitos, which allowed Tiger to play there. Tiger also played at the par 3 Heartwell golf course in Long Beach, as well as some of the municipals in Long Beach. In 1978, Tiger putted against comedian Bob Hope in a television appearance on The Mike Douglas Show. At age three, he shot a 48 over nine holes at the Navy course. At age five, he appeared in Golf Digest and on ABC's That's Incredible! Before turning seven, Tiger won the Under Age 10 section of the Drive, Pitch, and Putt competition, held at the Navy Golf Course in Cypress, California. In 1984 at the age of eight, he won the 9–10 boys' event, the youngest age group available, at the Junior World Golf Championships. He first broke 80 at age eight. He went on to win the Junior World Championships six times, including four consecutive wins from 1988 to 1991. When Woods was 13 years old, he played in the 1989 Big I, which was his first major national junior tournament. In the final round, he was paired with pro John Daly, who was then relatively unknown. The event's format placed a professional with each group of juniors who had qualified. Daly birdied three of the last four holes to beat Woods by only one stroke. As a young teenager, Woods first met Jack Nicklaus in Los Angeles at the Bel-Air Country Club, when Nicklaus was performing a clinic for the club's members. Woods was part of the show, and he impressed Nicklaus and the crowd with his skills and potential. Earl Woods had researched in detail the career accomplishments of Nicklaus and had set his young son the goals of breaking those records. Woods was 15 years old and a student at Western High School in Anaheim when he became the youngest U.S. Junior Amateur champion; this was a record that stood until it was broken by Jim Liu in 2010. He was named 1991's Southern California Amateur Player of the Year (for the second consecutive year) and Golf Digest Junior Amateur Player of the Year. In 1992, he defended his title at the U.S. Junior Amateur Championship, becoming the tournament's first two-time winner. He also competed in his first PGA Tour event, the Nissan Los Angeles Open (he missed the 36-hole cut), and was named Golf Digest Amateur Player of the Year, Golf World Player of the Year, and Golfweek National Amateur of the Year. The following year, Woods won his third consecutive U.S. Junior Amateur Championship; he remains the event's only three-time winner. In 1994, at the TPC at Sawgrass in Florida, he became the youngest winner of the U.S. Amateur Championship, a record he held until 2008 when it was broken by Danny Lee. He was a member of the American team at the 1994 Eisenhower Trophy World Amateur Golf Team Championships (winning), and the 1995 Walker Cup (losing). Woods graduated from Western High School at age 18 in 1994 and was voted "Most Likely to Succeed" among the graduating class. He had starred for the high school's golf team under coach Don Crosby. Woods was heavily recruited by college golf powers. He chose Stanford University, the 1994 NCAA champions. He enrolled at Stanford in the fall of 1994 under a golf scholarship and won his first collegiate event, the 40th Annual William H. Tucker Invitational, that September. He selected a major in economics and was nicknamed "Urkel" by college teammate Notah Begay III. In 1995, he successfully defended his U.S. Amateur title at the Newport Country Club in Rhode Island and was voted Pac-10 Player of the Year, NCAA First Team All-American, and Stanford's Male Freshman of the Year (an award that encompasses all sports). At age 19, Woods participated in his first PGA Tour major, the 1995 Masters, and tied for 41st as the only amateur to make the cut; two years later, he would win the tournament by 12 strokes. At age 20 in 1996, he became the first golfer to win three consecutive U.S. Amateur titles and won the NCAA individual golf championship. In winning the silver medal as leading amateur at The Open Championship, he tied the record for an amateur aggregate score of 281. He left college after two years in order to turn professional in the golf industry. In 1996, Woods moved out of California, stating in 2013 that it was due to the state's high tax rate. Woods turned pro at age 20 in August 1996 and immediately signed advertising deals with Nike, Inc. and Titleist that ranked as the most lucrative endorsement contracts in golf history at that time. Woods was named Sports Illustrated's 1996 Sportsman of the Year and PGA Tour Rookie of the Year. On April 13, 1997, he won his first major, the Masters, in record-breaking fashion and became the tournament's youngest winner at age 21. Two months later, he set the record for the fastest ascent to No. 1 in the Official World Golf Rankings. After a lackluster 1998, Woods finished the 1999 season with eight wins, including the PGA Championship, a feat not achieved since Johnny Miller did it in 1974. In 2000, Woods won six consecutive events on the PGA Tour, which was the longest winning streak since Ben Hogan did it in 1948. One of these was the U.S. Open, where he broke or tied nine tournament records in what Sports Illustrated called "the greatest performance in golf history", in which Woods won the tournament by a record 15-stroke margin and earned a check for $800,000. At age 24, he became the youngest golfer to achieve the Career Grand Slam. At the end of 2000, Woods had won nine of the twenty PGA Tour events he entered and had broken the record for lowest scoring average in tour history. He was named the Sports Illustrated Sportsman of the Year, the only athlete to be honored twice, and was ranked by Golf Digest magazine as the twelfth-best golfer of all time. 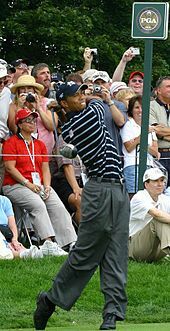 When Woods won the 2001 Masters, he became the only player to win four consecutive major professional golf titles, although not in the same calendar year, which came to be commonly known as the "Tiger Slam." Following a stellar 2001 and 2002 in which he continued to dominate the tour, Woods' career hit a slump. He did not win a major in 2003 or 2004. In September 2004, Vijay Singh overtook Woods in the Official World Golf Rankings, ending Woods' record streak of 264 weeks at No. 1. Woods rebounded in 2005, winning six PGA Tour events and reclaiming the top spot in July after swapping it back and forth with Singh over the first half of the year. Woods began dominantly in 2006, winning his first two PGA tournaments but failing to capture his fifth Masters championship in April. Following the death of his father in May, Woods took some time off from the tour and appeared rusty upon his return at the U.S. Open at Winged Foot, where he missed the cut. However, he quickly returned to form and ended the year by winning six consecutive tour events. At the season's close, Woods had 54 total wins that included 12 majors; he had broken the tour records for both total wins and total majors wins over eleven seasons. Woods continued to excel in 2007 and the first part of 2008. In April 2008, he underwent knee surgery and missed the next two months on the tour. Woods returned for the 2008 U.S. Open, where he struggled the first day but ultimately claimed a dramatic sudden death victory over Rocco Mediate that followed an 18-hole playoff, after which Mediate said, "This guy does things that are just not normal by any stretch of the imagination," and Kenny Perry added, "He beat everybody on one leg." Two days later, Woods announced that he would miss the remainder of the season due to additional knee surgery, and that his knee was more severely damaged than previously revealed, prompting even greater praise for his U.S. Open performance. Woods called it "my greatest ever championship." In Woods' absence, TV ratings for the remainder of the season suffered a huge decline from 2007. Woods had a much anticipated return to golf in 2009, when he performed well. His comeback included a spectacular performance at the 2009 Presidents Cup, but he failed to win a major, the first year since 2004 that he had not done so. After his marital infidelities came to light and received massive media coverage at the end of 2009 (see further details below), Woods announced in December that he would be taking an indefinite break from competitive golf. In February 2010, he delivered a televised apology for his behavior, saying "I was wrong and I was foolish." During this period, several companies ended their endorsement deals with Woods. 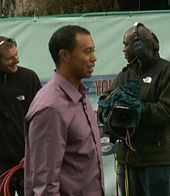 Woods returned to competition in April at the 2010 Masters, where he finished tied for fourth place. He followed the Masters with poor showings at the Quail Hollow Championship and the Players Championship, where he withdrew in the fourth round, citing injury. Shortly afterward, Hank Haney, Woods' coach since 2003, resigned the position. In August, Woods hired Sean Foley as Haney's replacement. The rest of the season went badly for Woods, who failed to win a single event for the first time since turning professional, while nevertheless finishing the season ranked No. 2 in the world. In 2011, Woods' performance continued to suffer; this took its toll on his ranking. After falling to No. 7 in March, he rebounded to No. 5 with a strong showing at the 2011 Masters Tournament, where he tied for fourth place. Due to leg injuries incurred at the Masters, he missed several summer stops on the PGA Tour. In July, he fired his longtime caddy Steve Williams (who was shocked by the dismissal), and replaced him on an interim basis with friend Bryon Bell. After returning to tournament play in August, Woods continued to falter, and his ranking gradually fell to a low of #58. He rose to No. 50 in mid-November after a third-place finish at the Emirates Australian Open, and broke his winless streak with a victory at December's Chevron World Challenge. Woods began his 2012 season with two tournaments (the Abu Dhabi HSBC Golf Championship and the AT&T Pebble Beach National Pro-Am) where he started off well, but struggled on the final rounds. Following the WGC-Accenture Match Play Championship, where he was knocked out in the second round by missing a 5-foot putt, Woods revised his putting technique and tied for second at the Honda Classic, with the lowest final round score in his PGA Tour career. After a short time off due to another leg injury, Woods won the Arnold Palmer Invitational, his first win on the PGA Tour since the BMW Championship in September 2009. Following several dismal performances, Woods notched his 73rd PGA Tour win at the Memorial Tournament in June, tying Jack Nicklaus in second place for most PGA Tour victories; a month later, Woods surpassed Nicklaus with a win at the AT&T National, to trail only Sam Snead, who accumulated 82 PGA tour wins. The year 2013 would bring a return of Woods' dominating play. In January, he won the Farmers Insurance Open by four shots for his 75th PGA Tour win. It was the seventh time he had won the event. In March, he won the WGC-Cadillac Championship, also for the seventh time, giving him his 17th WGC title and first since 2009. Two weeks later, he won the Arnold Palmer Invitational, winning the event for a record-tying 8th time. The win moved him back to the top of the world rankings. To commemorate that achievement, Nike was quick to launch an ad with the tagline "winning takes care of everything". During the 2013 Masters, Woods faced disqualification after unwittingly admitting in a post-round interview with ESPN that he had taken an illegal drop on the par-5 15th hole when his third shot had bounced off the pin and into the water. After further review of television footage, Woods was assessed a two-stroke penalty for the drop but was not disqualified. He finished tied for fourth in the event. Woods won The Players Championship in May 2013, his second career win at the event, notching his fourth win of the 2013 season. It was the quickest he had gotten to four wins in any season in his professional career. Woods had a poor showing at the 2013 U.S. Open as a result of an elbow injury that he sustained at The Players Championship. In finishing at 13-over-par, he recorded his worst score as a professional and finished 12 strokes behind winner Justin Rose. After a prolonged break because of the injury, during which he missed the Greenbrier Classic and his own AT&T National, he returned at the Open Championship at Muirfield. Despite being in contention all week and beginning the final round only two strokes behind Lee Westwood, he struggled with the speed of the greens and could only manage a 3-over-par 74 that left him tied for 6th place, five strokes behind eventual winner Phil Mickelson. Two weeks later, Woods returned to form at the WGC-Bridgestone Invitational, recording his 5th win of the season and 8th win at the event in its 15-year history. His second round 61 matched his record score on the PGA Tour and could easily have been a 59 were it not for some short missed birdie putts on the closing holes. This gave him a seven-stroke lead that he held onto for the rest of the tournament. Woods would never contend at the PGA Championship at Oak Hill Country Club and would come short of winning a major for the 5th full season, only contending in two of the four majors in 2013. After a slow start to 2014, Woods sustained an injury during the final round of the Honda Classic and was unable to finish the tournament. He withdrew after the 13th hole, citing back pain. He subsequently competed in the WGC-Cadillac Championship but was visibly in pain during much of the last round. He was forced to skip the Arnold Palmer Invitational at the end of March 2014, and after undergoing back surgery, he announced on April 1 that he would miss the Masters for the first time since 1994. Woods returned at the Quicken Loans National in June, however he stated that his expectations for the week were low. He would struggle with nearly every aspect of his game and miss the cut. He next played at The Open Championship, contested at Hoylake, where Woods had won eight years prior. Woods fired a brilliant 69 in the first round to put himself in contention, but shot 77 on Friday and would eventually finish 69th. Despite his back pain, he played at the 2014 PGA Championship where he failed to make the cut. On August 25, 2014, Woods and his swing coach Sean Foley parted ways. In the four years under Foley, he won eight times but no majors. He had previously won eight majors with Harmon and six with Haney. Woods said there is currently no timetable to find a replacement swing coach. On February 5, 2015, Woods withdrew from the Farmers Insurance Open after another back injury. Woods stated on his website that it was unrelated to his previous surgery and he would take a break from golf until his back healed. He returned for the Masters, finishing in a tie for 17th. In the final round, Woods injured his wrist after his club hit a tree root. He later stated that a bone popped out of his wrist, but he adjusted it back into place and finished the round. Woods then missed the cut at the 2015 U.S. Open and Open Championship, the first time Woods missed the cut at consecutive majors, finishing near the bottom of the leaderboard both times. He finished tied for 18th at the Quicken Loans National on August 2. In late August 2015, Woods played quite well at the Wyndham Championship finishing the tournament at 13-under, only four strokes behind the winner, and tied for 10th place. Woods offered only a brief comment on the speculation that he was still recovering from back surgery, saying it was "just my hip" but offering no specifics. Woods had back surgery on September 16, 2015. In late March 2016, he announced that he would miss the Masters while he recovered from the surgery; he had also missed the 2014 Masters due to a back problem. "I'm absolutely making progress, and I'm really happy with how far I've come," he explained in a statement. "But I still have no timetable to return to competitive golf." However, he did attend the Masters Champions Dinner on April 5, 2016. For the first time in his career, he missed all four majors in one year due to problems with his back. In October 2016, he told Charlie Rose on PBS that he still wanted to break Jack Nicklaus's record of 18 major titles. Woods underwent back surgery in December 2016 and spent the next 15 months off the Tour. He made his return to competitive golf in the Hero World Challenge. Woods' back problems continued to hinder him in 2017, as he missed the cut at the Farmers Insurance Open in January, and pulled out of a European Tour event in Dubai on February 3. On March 31, Woods announced on his website that he would not be playing in the 2017 Masters Tournament despite being cleared to play by his doctors. Woods said that although he was happy with his rehabilitation, he did not feel "tournament ready." Woods subsequently told friends, “I’m done”. On April 20, Woods announced that he had undergone his fourth back surgery since 2014 to alleviate back and leg pain. Recovery time required up to six months, meaning that Woods would spend the rest of the year without playing any professional golf. Woods returned to competitive golf at the Hero World Challenge in the Bahamas. He shot rounds of 69-68-75-68 and finished tied for 9th place. His world ranking went from 1,199th to 668th, which was the biggest jump in the world rankings in his career. On Sunday, March 11, 2018, he finished one-shot back and tied for second at the Valspar Championship in Florida, his first top-five finish on the PGA Tour since 2013. He then tied for sixth with a score of five under par at the 2018 Open Championship. At the last major of the year Woods finished second at the 2018 PGA Championship, two shots behind the winner Brooks Koepka. It was his best result in a major since 2009 (second at the 2009 PGA Championship) and moved up to 26th in the world rankings. His final round of 64 was his best ever final round in a major. Woods got back in the winner's circle for the 80th time in his PGA Tour career on September 23, 2018, when he won the season-ending Tour Championship at East Lake Golf Club for the second time, and that tournament for the third time. He shot rounds of 65-68-65-71 to win by two strokes over Billy Horschel. On Sunday, April 14, 2019, Woods won the 2019 Masters Tournament, his first major championship win since 2008 and his 15th major overall. He finished 13 under par to win by one stroke over Dustin Johnson, Xander Schauffele and Brooks Koepka, becoming, at age 43, the second oldest golfer ever to win the Masters tournament, after Jack Nicklaus's triumph in 1986 at age 46. On August 20, 2007, California Governor Arnold Schwarzenegger and his wife Maria Shriver announced that Woods would be inducted into the California Hall of Fame. He was inducted December 5, 2007 at The California Museum for History, Women and the Arts in Sacramento. In December 2009, Woods was named "Athlete of the Decade" by the Associated Press. He was named Associated Press Male Athlete of the Year a record-tying four times, and is one of only two people to be named Sports Illustrated's Sportsman of the Year more than once. Since his record-breaking win at the 1997 Masters, Woods has been the biggest name in golf and his presence in tournaments has drawn a huge fan following. Some sources have credited him for dramatically increasing prize money in golf, generating interest in new PGA tournament audiences, and for drawing the largest TV ratings in golf history. During the first decade of his professional career, Woods was the world's most marketable athlete. Shortly after his 21st birthday in 1996, he signed endorsement deals with numerous companies, including General Motors, Titleist, General Mills, American Express, Accenture, and Nike, Inc. In 2000, he signed a 5-year, $105 million contract extension with Nike, which was the largest endorsement package signed by a professional athlete at that time. Woods' endorsement has been credited with playing a significant role in taking the Nike Golf brand from a "start-up" golf company earlier in the previous decade to becoming the leading golf apparel company in the world and a major player in the equipment and golf ball market. Nike Golf is one of the fastest growing brands in the sport, with an estimated $600 million in sales. 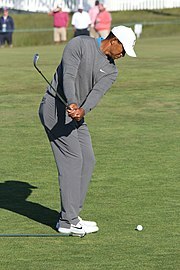 Woods has been described as the "ultimate endorser" for Nike Golf, frequently seen wearing Nike gear during tournaments, and even in advertisements for other products. Woods receives a percentage from the sales of Nike Golf apparel, footwear, golf equipment, golf balls, and has a building named after him at Nike's headquarters campus in Beaverton, Oregon. Woods collaborated closely with TAG Heuer to develop the world's first professional golf watch, which was released in April 2005. The lightweight, titanium-construction watch, designed to be worn while playing the game, incorporates numerous innovative design features to accommodate golf play. It is capable of absorbing up to 5,000 Gs of shock, far in excess of the forces generated by a normal golf swing. In 2006, the TAG Heuer Professional Golf Watch won the prestigious iF product design award in the Leisure/Lifestyle category. Woods also endorsed the Tiger Woods PGA Tour series of video games; he has done so since 1999. In 2006, he signed a six-year contract with Electronic Arts, the series' publisher. In February 2007, Woods, Roger Federer and Thierry Henry became ambassadors for the "Gillette Champions" marketing campaign. Gillette did not disclose financial terms, though an expert estimated the deal could total between $10 million and $20 million. In 1997, Woods and golfer Arnold Palmer initiated a civil case against Bruce Matthews (the owner of Gotta Have It Golf, Inc.) and others in the effort to stop the unauthorized sale of their images and alleged signatures in the memorabilia market. Matthews and associated parties counterclaimed that Woods and his company, ETW Corporation, committed several acts including breach of contract, breach of implied duty of good faith, and violations of Florida's Deceptive and Unfair Trade Practices Act. Palmer also was named in the counter-suit, accused of violating the same licensing agreement in conjunction with his company Arnold Palmer Enterprises. On March 12, 2014, a Florida jury ruled in favor of Gotta Have It on its breach of contract and other related claims, rejected ETW's counterclaims, and awarded Gotta Have It $668,346 in damages. The award may end up exceeding $1 million once interest has been factored in, though the ruling may be appealed. In August 2016, Woods announced that he would be seeking a new golf equipment partner after the news of Nike's exit from the equipment industry. It was announced on January 25, 2017, that he would be signing a new club deal with TaylorMade. He added the 2016 M2 driver along with the 2017 M1 fairway woods, with irons to be custom made at a later date. He also added his Scotty Cameron Newport 2 GSS, a club he used to win 13 of his 15 majors. Also, in late 2016, he would add Monster Energy as his primary bag sponsor, replacing MusclePharm. Woods has appeared on Forbes' list of the world's highest-paid athletes. According to Golf Digest, Woods made $769,440,709 from 1996 to 2007, and the magazine predicted that Woods would pass a billion dollars in earnings by 2010. In 2009, Forbes confirmed that Woods was indeed the world's first professional athlete to earn over a billion dollars in his career, after accounting for the $10 million bonus Woods received for the FedEx Cup title. The same year, Forbes estimated his net worth to be $600 million, making him the second richest person of color in the United States, behind only Oprah Winfrey. In 2015, Woods ranked ninth in Forbes' list of world's highest-paid athletes, being the top among Asian Americans or the fourth among African Americans. As of 2017, Woods was considered to be the highest-paid golfer in the world. Early in Woods' career, a small number of golf industry analysts expressed concern about his impact on the competitiveness of the game and the public appeal of professional golf. Sportswriter Bill Lyon of Knight Ridder asked in a column, "Isn't Tiger Woods actually bad for golf?" (though Lyon ultimately concluded that he was not). At first, some pundits feared that Woods would drive the spirit of competition out of the game of golf by making existing courses obsolete and relegating opponents to simply competing for second place each week. A related effect was measured by University of California economist Jennifer Brown, who found that other golfers scored higher when competing against Woods than when he was not in the tournament. The scores of highly skilled (exempt) golfers are nearly one stroke higher when playing against Woods. This effect was larger when he was on winning streaks and disappeared during his well-publicized slump in 2003–04. Brown explains the results by noting that competitors of similar skill can hope to win by increasing their level of effort, but that, when facing a "superstar" competitor, extra exertion does not significantly raise one's level of winning while increasing risk of injury or exhaustion, leading to reduced effort. Woods has won 81 official PGA Tour events, including 15 majors. He is 14–1 when going into the final round of a major with at least a share of the lead. Multiple golf experts have heralded Woods as "the greatest closer in history". He owns the lowest career scoring average and the most career earnings of any player in PGA Tour history. Woods' victory at the 2013 Players Championship also marked a win in his 300th PGA Tour start. He also won golf tournaments in his 100th (in 2000) and 200th (in 2006) tour starts. Woods has spent the most consecutive and cumulative weeks atop the world rankings. He is one of five players (along with Gene Sarazen, Ben Hogan, Gary Player, and Jack Nicklaus) to have won all four major championships in his career, known as the Career Grand Slam, and was the youngest to do so. Woods is the only player to have won all four major championships in a row, accomplishing the feat in the 2000–2001 seasons. 2Defeated DiMarco in a sudden-death playoff: Woods (3) and DiMarco (4). 3Defeated Mediate with a par on 1st sudden death hole after 18-hole playoff was tied at even par. This was the final time an 18-hole playoff was used in competition. 1 Canceled following the September 11 attacks. Woods claimed 17 Guinness World Records, within golf and 3 other records related to his appearance in the video game. After Usain Bolt and Michael Phelps, he holds the third highest number of Guinness World Records claimed by a sportsman within one discipline. When Woods first joined the PGA Tour in 1996, his long drives had a large impact on the world of golf, but he did not upgrade his equipment in the following years. He insisted upon the use of True Temper Dynamic Gold steel-shafted clubs and smaller steel clubheads that promoted accuracy over distance. Many opponents caught up to him, and Phil Mickelson even made a joke in 2003 about Woods using "inferior equipment", which did not sit well with Nike, Titleist or Woods. During 2004, Woods finally upgraded his driver technology to a larger clubhead and graphite shaft, which, coupled with his clubhead speed, again made him one of the tour's longest players off the tee. Despite his power advantage, Woods has always focused on developing an excellent all-around game. Although in recent years[when?] he has typically been near the bottom of the Tour rankings in driving accuracy, his iron play is generally accurate, his recovery and bunker play is very strong, and his putting (especially under pressure) is possibly his greatest asset. He is largely responsible for a shift to higher standards of athleticism amongst professional golfers, and is known for utilizing more hours of practice than most. From mid-1993 (while he was still an amateur) until 2004, Woods worked almost exclusively with leading swing coach Butch Harmon. From mid-1997, Harmon and Woods fashioned a major redevelopment of Woods' full swing, achieving greater consistency, better distance control, and better kinesiology. The changes began to pay off in 1999. Woods and Harmon eventually parted ways. From March 2004 to 2010, Woods was coached by Hank Haney, who worked on flattening his swing plane. Woods continued to win tournaments with Haney, but his driving accuracy dropped significantly. Haney resigned under questionable circumstances in May 2010 and was replaced by Sean Foley. Fluff Cowan served as Woods' caddie from the start of his professional career until Woods dismissed him in March 1999. He was replaced by Steve Williams, who became a close friend of Woods and is often credited with helping him with key shots and putts. In June 2011, Woods dismissed Williams after he caddied for Adam Scott in the U.S. Open and replaced him with friend Bryon Bell on an interim basis. Joe LaCava, a former caddie of both Fred Couples and Dustin Johnson, was hired by Woods shortly after and has remained Woods' caddie since then. Wood covers: Stitch Brand with TGR Logo. Putter cover: Nike Putter Cover. The TGR Foundation was established in 1996 by Woods and his father Earl as the Tiger Woods Foundation, with the primary goal of promoting golf among inner-city children. The foundation has conducted junior golf clinics across the country, and sponsors the Tiger Woods Foundation National Junior Golf Team in the Junior World Golf Championships. As of December 2010, TWF employed approximately 55 people. The foundation operates the Tiger Woods Learning Center, a $50-million, 35,000-square-foot (3,300 m2) facility in Anaheim, California, providing college-access programs for underserved youth. The TWLC opened in 2006 and features seven classrooms, extensive multi-media facilities and an outdoor golf teaching area. The center has since expanded to four additional campuses: two in Washington, D.C.; one in Philadelphia; and one in Stuart, Florida. In November 2006, Woods announced his intention to begin designing golf courses around the world through a new company, Tiger Woods Design. A month later, he announced that the company's first course would be in Dubai as part of a 25.3-million-square-foot development, The Tiger Woods Dubai. The Al Ruwaya Golf Course was initially expected to finish construction in 2009. As of February 2010, only seven holes had been completed; in April 2011, The New York Times reported that the project had been shelved permanently. In 2013, the partnership between Tiger Woods Design and Dubai Holding was dissolved. These projects have encountered problems that have been attributed to factors that include overly optimistic estimates of their value, declines throughout the global economy (particularly the U.S. crash in home prices), and the decreased appeal and marketability of Woods following his 2009 infidelity scandal. Woods wrote a golf instruction column for Golf Digest magazine from 1997 to February 2011. In 2001 he wrote a best-selling golf instruction book, How I Play Golf, which had the largest print run of any golf book for its first edition, 1.5 million copies. In March 2017, he published a memoir, The 1997 Masters: My Story, co-authored by Lorne Rubenstein, which focuses on his first Masters win. In November 2003, Woods became engaged to Elin Nordegren, a Swedish former model and daughter of former minister of migration Barbro Holmberg and radio journalist Thomas Nordegren. They were introduced during The Open Championship in 2001 by Swedish golfer Jesper Parnevik, who had employed her as an au pair. They married on October 5, 2004, at the Sandy Lane resort in Barbados, and lived at Isleworth, a community in Windermere, a suburb of Orlando, Florida. In 2006, they purchased a $39-million estate in Jupiter Island, Florida, and began constructing a 10,000-square-foot home; Woods moved there in 2010 following the couple's divorce. Woods and Nordegren's first child was a girl born in 2007, whom they named Sam Alexis Woods. Woods chose the name because his own father had always called him Sam. Their son, Charlie Axel Woods, was born in 2009. In November 2009, the National Enquirer published a story claiming that Woods had had an extramarital affair with New York City nightclub manager Rachel Uchitel, who denied the claim. Two days later, around 2:30 a.m. on November 27, Woods was driving from his Florida mansion in his Cadillac Escalade SUV when he collided with a fire hydrant, a tree, and several hedges near his home. He was treated for minor facial lacerations and received a ticket for careless driving. Following intense media speculation about the cause of the accident, Woods released a statement on his website and took sole responsibility for the accident, calling it a "private matter" and crediting his wife for helping him from the car. On November 30, Woods announced that he would not be appearing at his own charity golf tournament, the Chevron World Challenge, nor any other tournaments in 2009, due to his injuries. On December 2, following Us Weekly's previous day reporting of a purported mistress and subsequent release of a voicemail message allegedly left by Woods for the woman, Woods released a further statement. He admitted transgressions and apologized to "all of those who have supported [him] over the years", while reiterating his and his family's right to privacy. Over the next few days, more than a dozen women claimed in various media outlets to have had affairs with Woods. On December 11, he released a third statement admitting to infidelity and he apologized again. He also announced that he would be taking "an indefinite break from professional golf." In the days and months following Woods' admission of multiple infidelities, several companies re-evaluated their relationships with him. Accenture, AT&T, Gatorade and General Motors completely ended their sponsorship deals, while Gillette suspended advertising featuring Woods. TAG Heuer dropped Woods from advertising in December 2009 and officially ended their deal when his contract expired in August 2011. Golf Digest suspended Woods's monthly column beginning with the February 2010 issue. In contrast, Nike continued to support Woods, as did Electronic Arts, which was working with Woods on the game Tiger Woods PGA Tour Online. A December 2009 study estimated the shareholder loss caused by Woods's affairs to be between $5 billion and $12 billion. On February 19, 2010, Woods gave a televised statement in which he said he had undertaken a 45-day therapy program that began at the end of December. He again apologized for his actions. "I thought I could get away with whatever I wanted to," he said. "I felt that I had worked hard my entire life and deserved to enjoy all the temptations around me. I felt I was entitled. Thanks to money and fame, I didn't have to go far to find them. I was wrong. I was foolish." He said he did not know yet when he would be returning to golf. On March 16, he announced that he would play in the 2010 Masters Tournament. After seven years of marriage, Woods and his wife Elin divorced on August 23, 2010. At a hearing on October 27, 2017, Woods pleaded guilty to reckless driving. He received a year of probation, was fined $250, and ordered to undergo 50 hours of community service along with regular drug tests. He was not allowed to drink alcohol during the probation, and if he violated the probation he would be sentenced to 90 days in jail with an additional $500 fine. Woods fires a handgun at a shooting range outside San Diego. Woods was raised as a Buddhist, and he actively practiced his faith from childhood until well into his adult, professional golf career. In a 2000 article, Woods was quoted as saying that he "believes in Buddhism... not every aspect, but most of it." He has attributed his deviations and infidelity to his losing track of Buddhism. He said, "Buddhism teaches me to stop following every impulse and to learn restraint. Obviously I lost track of what I was taught." Woods is registered as an independent voter. In January 2009, Woods delivered a speech commemorating the military at the We Are One: The Obama Inaugural Celebration at the Lincoln Memorial. 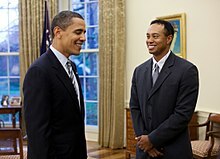 In April 2009, Woods visited the White House while promoting the golf tournament he hosts, the AT&T National. In December 2016 and again in November 2017, Woods played golf with President Donald Trump at the Trump International Golf Club in West Palm Beach. On March 18, 2013, Woods announced that he and Olympic gold medal skier Lindsey Vonn were dating. They split up in May 2015. From November 2016 - August 2017, Woods was in a relationship with stylist Kristin Smith. Woods announced in November 2017 that he was in a relationship with restaurant manager Erica Herman, following speculation about their relationship that began the month prior. ^ These are the 15 majors, 18 WGC events, and his eight tour wins. ^ This is calculated by adding Woods' 81 PGA Tour victories, 8 regular European Tour titles, 2 Japan Tour wins, 1 Asian Tour crown, and the 16 other wins in his career. "Who is the greatest golfer ever: Tiger or Jack?". For The Win. April 13, 2018. Retrieved July 19, 2018. Diaz, Jaime. "What made Tiger Woods great—and can again – Golf Digest". Golf Digest. Retrieved July 19, 2018. "Phil: Tiger in prime played best golf ever". ESPN.com. Retrieved July 19, 2018. ^ a b c d Dahlberg, Tim (December 12, 2009). "Two weeks that shattered the legend of Tiger Woods". Fox News. Associated Press. Retrieved January 23, 2012. ^ "Westwood becomes world number one". BBC News. October 31, 2010. ^ a b c "Tiger Woods moves to 50th in rankings". ESPN. November 13, 2011. Retrieved November 14, 2011. ^ "Complete list of Tiger Woods' injuries". PGA Tour. 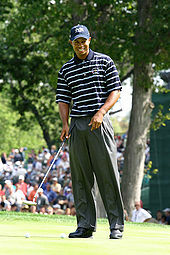 ^ "With game on point, Tiger Woods is in perfect place to win again at Firestone". USA Today. August 1, 2018. ^ a b Reid, Philip (August 14, 2018). "For the new Tiger Woods, second place is far from first loser". The Irish Times. Dublin. ^ Kelley, Brent (October 20, 2009). "Woods Clinches PGA Player of the Year Award". About.com: Golf. Retrieved December 2, 2009. ^ "Tracking Tiger". NBC Sports. Retrieved June 3, 2009. ^ "Tiger Woods Biography – childhood, children, parents, name, history, mother, young, son, old, information, born". Notablebiographies.com. Retrieved December 16, 2017. ^ "Tiger Woods' father, Earl, succumbs to cancer". Espn.com. May 5, 2006. Retrieved December 16, 2017. ^ Kelley, Brent. "Tiger Woods' Parents: Meet Mom and Dad". Thoughtco.com. Retrieved December 16, 2017. ^ "Earning His Stripes". AsianWeek. October 11, 1996. Archived from the original on January 16, 1998. Retrieved June 18, 2009. ^ "Earl Woods" (obituary). Telegraph (June 5, 2006). Retrieved June 19, 2012. ^ "Woods stars on Oprah, says he's 'Cablinasian'". Lubbock Avalanche-Journal. Associated Press. April 23, 1997. Archived from the original on December 12, 2007. Retrieved June 18, 2009. ^ Callahan, Tom (May 9, 2006). "Tiger's dad gave us all some lessons to remember". Golf Digest. Retrieved January 24, 2012. ^ Chandler, Rick (June 7, 2012). "Tiger Woods' niece makes her major pro golf tourney debut today". NBC Sports. Archived from the original on June 8, 2012. Retrieved June 7, 2012. ^ Training a Tiger: Raising a Winner in Golf and in Life, by Earl Woods and Pete McDaniel, 1997. ^ "Play Golf Where Tiger Became Tiger". Golf.com. ^ Training A Tiger, by Earl Woods and Pete McDaniel, 1997, p. 64. ^ "1984 Champions". Junior World Golf Championships. Retrieved May 13, 2007. ^ The Wicked Game: Arnold Palmer, Jack Nicklaus, Tiger Woods, and the Story of Modern Golf, by Howard Sounes, 2004, William Morrow, New York, ISBN 0-06-051386-1, p. 187; originally appeared in The Wall Street Journal, Nike's Tiger Woods professional career launch advertisement, August 1996. ^ "1985 Champions". Junior World Golf Championships. Retrieved May 13, 2007. ^ "1988 Champions". Junior World Golf Championships. Retrieved May 13, 2007. ^ "1989 Champions". Junior World Golf Championships. Retrieved May 13, 2007. ^ "1990 Champions". Junior World Golf Championships. Retrieved May 13, 2007. ^ "1991 Champions". Junior World Golf Championships. Retrieved May 13, 2007. The Wicked Game: Arnold Palmer, Jack Nicklaus, Tiger Woods, and the Story of Modern Golf, by Howard Sounes. ^ Training A Tiger: A Father's Guide to Raising a Winner in Both Golf and Life, by Earl Woods with Pete McDaniel, 1997, Harper Collins, New York, ISBN 0-06-270178-9, p. 180. ^ Jack Nicklaus: Memories and Mementos from Golf's Golden Bear, by Jack Nicklaus with David Shedloski, 2007, Stewart, Tabori & Chang, New York, ISBN 1-58479-564-6, p. 130. ^ "1991 U.S. Junior Amateur". U.S. Junior Amateur. Retrieved May 13, 2007. ^ "1992 U.S. Junior Amateur". U.S. Junior Amateur. Retrieved May 12, 2007. ^ "Tiger Woods". IMG Speakers. Archived from the original on April 29, 2007. Retrieved June 18, 2009. ^ "1993 U.S. Junior Amateur". U.S. Junior Amateur. Retrieved May 12, 2007. ^ a b Sounes, p. 277. ^ "Notable Past Players". International Golf Federation. Retrieved May 13, 2007. ^ Thomsen, Ian (September 9, 1995). "Ailing Woods Unsure for Walker Cup". International Herald Tribune. Retrieved January 4, 2011. ^ The Wicked Game: Arnold Palmer, Jack Nicklaus, Tiger Woods, and the Story of Modern Golf, by Howard Sounes, 2004, William Morrow, New York, ISBN 0-06-051386-1, information listed on inset photos between pages 168 and 169. "Famous People – Speech Differences and Stutter". Disabled World. Retrieved May 24, 2015. "Tiger Woods writes letter of support to fellow stutterer". The Guardian. May 12, 2015. Retrieved May 24, 2015. Sirak, Ron (May 12, 2015). "Former stutterer Tiger Woods writes letter to young boy being bullied". Golf Digest. Retrieved May 24, 2015. ^ "Tiger Woods Writes Letter to Boy With Stuttering Problem". ABC News. May 12, 2015. Retrieved May 24, 2015. ^ "Stanford Men's Golf Team – Tiger Woods". Stanford Men's Golf Team. April 8, 2003. Retrieved July 19, 2009. ^ Rosaforte, Tim (1997). Tiger Woods: The Makings of a Champion. St. Martin's Press. pp. 84, 101. ISBN 0-312-96437-4. ^ "PAC-10 Men's Golf" (PDF). PAC-10 Conference. Retrieved May 13, 2007. ^ "Tiger Woods through the Ages..." Geocities. Archived from the original on July 30, 2009. Retrieved May 12, 2007. ^ "Tiger Woods Captures 1996 NCAA Individual Title". Stanford University. Archived from the original on October 29, 2006. Retrieved May 13, 2007. ^ Rosaforte 1997, p. 160. Wood, Robert W. (January 23, 2013). "Tiger Woods Moved Too, Says Mickelson Was Right About Taxes". Forbes. Retrieved January 26, 2013. Martosko, David (January 22, 2013). "Tiger Woods: I left California over tax rates too". Daily Caller. Retrieved January 26, 2013. ^ Sirak, Ron. "10 Years of Tiger Woods Part 1". Golf Digest. Retrieved May 21, 2007. ^ Sirak, Ron. "Golf's first Billion-Dollar Man". Golf Digest. Archived from the original on May 13, 2007. Retrieved May 12, 2007. ^ a b Reilly, Rick (December 23, 1996). "1996: Tiger Woods". Sports Illustrated. Retrieved May 13, 2007. ^ Sirak, Ron. "10 Years of Tiger Woods Part 2". Golf Digest. Retrieved May 21, 2007. ^ "Woods scoops world rankings award". London: BBC Sport. March 15, 2006. Retrieved May 12, 2007. ^ a b Diaz, Jaime. "The Truth about Tiger". Golf Digest. Archived from the original on April 15, 2007. Retrieved May 12, 2007. ^ "Woods is PGA Tour player of year". The Topeka Capital-Journal. Associated Press. Archived from the original on April 3, 2010. Retrieved May 10, 2009. ^ "Tiger Woods undergoes second laser eye surgery". Golf Today. May 15, 2007. Retrieved June 19, 2012. ^ Bestrom, Craig; Strege, John. "Eyes of the Tiger: Tiger Woods – LASIK laser eye surgery". Eyesurgeryusa.com. Retrieved June 19, 2012. ^ "Woods has second laser eye surgery". Golf Magazine. May 15, 2007. Retrieved June 19, 2012. ^ Garrity, John (June 26, 2000). "Open and Shut". Sports Illustrated. Retrieved August 15, 2007. ^ Sirak, Ron. "10 Years of Tiger Woods Part 3". Golf Digest. Retrieved May 21, 2007. Price, S.L. (April 3, 2000). "Tunnel Vision". Sports Illustrated. Retrieved May 13, 2007. Yocom, Guy (July 2000). "50 Greatest Golfers of All Time: And What They Taught Us". Golf Digest. Archived from the original on December 17, 2007. Retrieved December 5, 2007. ^ "The remarkable drive of Tiger Woods". CNN. Retrieved March 27, 2012. ^ Shedloski, Dave (July 27, 2006). "Woods is starting to own his swing". PGA Tour. Archived from the original on September 22, 2007. Retrieved May 12, 2007. ^ "Hard labor pays off for Singh". Sports Illustrated. Reuters. September 7, 2004. Retrieved May 10, 2009. ^ Verdi, Bob. "A Rivalry is Reborn". Golf World. Archived from the original on May 14, 2007. Retrieved May 21, 2007. Morfit, Cameron (March 6, 2006). "Tiger Woods's Rivals Will Be Back. Eventually". Golf Magazine. Archived from the original on September 19, 2011. Retrieved May 11, 2009. Hack, Damon (April 10, 2006). "Golf: Notebook; Trouble on Greens Keeps Woods From His Fifth Green Jacket". The New York Times. Retrieved May 11, 2009. ^ Litsky, Frank (May 4, 2006). 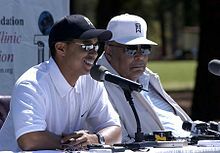 "Earl Woods, 74, Father of Tiger Woods, Dies". The New York Times. Retrieved May 12, 2009. ^ "Man of the Year". PGA. Associated Press. Retrieved June 18, 2009. ^ "Tiger Woods undergoes knee surgery". Agence France-Presse. April 15, 2008. Archived from the original on December 12, 2008. Retrieved December 10, 2008. "Tiger puts away Mediate on 91st hole to win U.S. Open". ESPN. Associated Press. June 16, 2008. Retrieved December 30, 2008. Savage, Brendan (June 25, 2008). "Rocco Mediate still riding U.S. Open high into Buick Open". The Flint Journal. Archived from the original on May 5, 2012. Retrieved June 19, 2009. Lage, Larry (June 26, 2008). "Mediate makes the most of his brush with Tiger". The Seattle Times. Associated Press. Retrieved June 19, 2009. Steinberg, Mark (June 18, 2008). "Tiger Woods to Undergo Reconstructive Knee Surgery and Miss Remainder of 2008 Season". TigerWoods.com. Archived from the original on June 17, 2008. Retrieved June 18, 2008. Dorman, Larry (June 19, 2008). "Woods to Have Knee Surgery, Ending His Season". The New York Times. Retrieved October 13, 2009. Donegan, Lawrence (June 17, 2008). "Woods savours 'greatest triumph' after epic duel with brave Mediate". The Guardian. UK. Retrieved June 30, 2008. ^ "Tiger's Return Expected To Make PGA Ratings Roar". The Nielsen Company 2009. February 25, 2009. Retrieved March 30, 2009. Dahlberg, Tim (March 1, 2009). "Anything can happen: It did in Tiger's return". San Francisco Chronicle. Retrieved July 1, 2009. Ferguson, Doug (October 12, 2009). "Americans win the Presidents Cup". Cumberland Times-News. Archived from the original on June 4, 2012. Retrieved December 17, 2009. Barber, Phil (October 11, 2009). "Americans win the Presidents Cup". The Press Democrat. Archived from the original on October 3, 2011. Retrieved October 27, 2009. ^ a b "Tiger Woods apologises to wife Elin for affairs". BBC Sport. London. February 19, 2010. Retrieved February 23, 2010. ^ a b c "AT&T cuts connection with Woods". ESPN. Associated Press. January 1, 2010. Retrieved January 23, 2012. ^ "Mickelson wins Masters; Tiger 5 back". ESPN. April 11, 2010. Retrieved April 12, 2010. ^ Harig, Bob (May 1, 2010). "Woods misses sixth PGA Tour cut". ESPN. Retrieved May 1, 2010. ^ Evans, Farrell (February 24, 2012). "Nick Watney eliminates Tiger Woods". ESPN. Retrieved February 24, 2012. ^ "Tiger wins Memorial to match Nicklaus on 73 wins". The Times of India. June 4, 2012. Retrieved June 7, 2012. ^ "Tiger Woods wins AT&T to pass Jack Nicklaus record". BBC Sport. July 2, 2012. Retrieved July 6, 2012. ^ Evans, Farrell (January 29, 2013). "Tiger takes Torrey for 75th tour win". ESPN. Retrieved March 20, 2013. 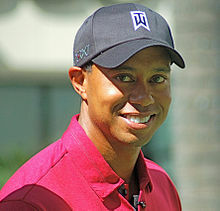 ^ "Tiger Woods prevails at Doral". ESPN. Associated Press. March 10, 2013. Retrieved March 20, 2013. ^ "Tiger returns to No. 1, wins Bay Hill". ESPN. Associated Press. March 25, 2013. Retrieved March 25, 2013. ^ Boren, Cindy (March 27, 2013). "Tiger Woods Nike ad causes a stir with "winning takes care of everything" message". The Washington Post. ^ "Is Tiger Woods facing disqualification at Masters?". CBS Sports. Retrieved April 13, 2013. ^ "Tiger Woods walks off at Honda Classic". bunkered. March 3, 2014. Retrieved April 1, 2014. ^ "Tiger Woods a doubt for the Masters". bunkered. March 19, 2014. Retrieved April 1, 2014. ^ "Tiger Woods out of the Masters". bunkered. April 1, 2014. Retrieved April 1, 2014. ^ "Tiger Woods splits with swing coach Sean Foley". USA Today. August 25, 2014. ^ Van Sickle, Gary (February 5, 2015). "Tiger Withdraws From the Farmers Insurance Open With Bad Back". Golf.com. ^ "His back feeling better, Tiger plans to work on his game and play again soon". tigerwoods.com. February 11, 2015. ^ Schwartz, Nick (April 12, 2015). "Tiger Woods hurts his wrist after hitting a root at the Masters". USA Today. Porter, Kyle (June 19, 2015). "Tiger Woods improves with 76, but misses cut badly at 2015 US Open". CBS Sports. Porter, Kyle (July 18, 2015). "2015 British Open: Tiger Woods cut at consecutive majors for first time". CBS Sports. Archived from the original on July 21, 2015. ^ Harig, Bob (August 2, 2015). 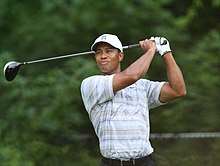 "Tiger confident after results at Quicken Loans National". ESPN. Retrieved August 13, 2015. ^ Velin, Bob (August 24, 2015). "Tiger Woods falls short, ends season at Wyndham". USA Today. Tyson's Corners, Virginia. Retrieved April 6, 2015. ^ Kalland, Bobby (August 23, 2015). "Tiger Woods sputters in final round, shoots 70 at Wyndham Championship". CBS Sports. Retrieved April 6, 2016. ^ "Tiger Undergoes Successful Back Surgery, Is Hopeful To Return in Early 2016". TigerWoods.com. September 18, 2015. Retrieved April 6, 2015. ^ Grez, Matias (April 2, 2016). "Tiger Woods: Golfer to miss the Masters". CNN International. Retrieved April 6, 2016. ^ Harig, Bob (April 2, 2016). "Tiger Woods chooses health over Masters". ABC News. Retrieved April 5, 2016. ^ Brennan, Christine (April 5, 2016). "Brennan: Tiger Woods isn't playing in Masters but still very much present". USA Today. Retrieved April 5, 2016. ^ "Tiger Wood's bold vision to break Jack Nicklaus's record of 18 major titles". Golf Channel. October 20, 2016. Retrieved October 24, 2016. ^ "Tiger Woods looks to the positives after fading following flying start". Irish Independent. Press Association. December 2, 2016. Retrieved December 6, 2016. ^ Harig, Bob (April 1, 2017). "Tiger Woods to miss Masters for third time in four years". ESPN. Retrieved April 14, 2017. ^ "Tiger not 'tournament ready,' will miss Masters". www.tigerwoods.com. March 31, 2017. Retrieved April 14, 2017. Zak, Sean (April 20, 2017). "Breaking: Tiger Woods undergoes back surgery to alleviate ongoing pain". Golf Magazine. Retrieved April 20, 2017. "Tiger Woods has a 4th back surgery". MSN News. Archived from the original on April 22, 2017. Retrieved April 20, 2017. ^ Crouse, Karen (March 11, 2018). "He Stuck to Golf: Tiger Woods, Roaring Back, Ties for 2nd". The New York Times. ^ Jurejko, Jonathan (August 13, 2018). "US PGA Championship: Brooks Koepka holds off Tiger Woods to win at Bellerive". BBC Sport. ^ McGowan, Tom; Sinnott, John (September 24, 2018). "Tiger Woods wins a PGA Tour event for the first time since 2013". CNN. ^ "Masters 2019: Tiger Woods wins 15th major with thrilling Augusta victory". BBC Sport. April 14, 2019. Retrieved April 14, 2019. ^ Crouse, Karen (April 14, 2019). "In a Stirring Return to the Top, Tiger Woods Captures the Masters at 43". The New York Times. Retrieved April 14, 2019. "Apple CEO among latest inductees to California Hall of Fame". U-T San Diego. August 20, 2007. Archived from the original on August 29, 2007. Retrieved July 15, 2009. "California Hall of Fame: 2007 Inductees" Archived January 10, 2008, at the Wayback Machine, californiamuseum.org. Retrieved September 11, 2007. ^ "Woods named top athlete of decade". ESPN. December 17, 2009. Retrieved January 19, 2010. ^ "Tiger named AP's Athlete of the Decade". NY Daily News. Associated Press. December 16, 2009. Retrieved August 3, 2017. Slezak, Carol (April 1, 2007). "Tiger's Tour, 10 years after his Masters breakthrough". Chicago Sun-Times. Archived from the original on October 25, 2012. Retrieved March 30, 2009. Reilly, Rick; Garrity, John; Diaz, Jaime (April 1, 1997). "Tiger 1997: The buzz that rocked the cradle". Golf Magazine. Retrieved March 30, 2009. "With Tiger not a factor, preliminary ratings down for PGA". Sports Illustrated. Associated Press. August 20, 2001. Retrieved March 30, 2009. Ziemer, Tom (April 8, 2005). "PGA jungle needs its Tiger on prowl". The Badger Herald. Retrieved March 30, 2009. Whitmer, Michael (April 2, 2009). "Woods shows mettle again". The Boston Globe. Retrieved August 11, 2009. ^ a b c Berger, Brian., "Nike Golf Extends Contract with Tiger Woods", Sports Business Radio, December 11, 2006. Retrieved September 14, 2007. ^ a b c DiCarlo, Lisa (March 18, 2004). "Six Degrees of Tiger Woods". Forbes. Retrieved December 17, 2009. ^ " Branding and Celebrity Endorsements" Archived October 14, 2007, at the Wayback Machine, VentureRepublic.com. Retrieved September 14, 2007. ^ a b Park, Alice., "Member of the Club", Time, April 12, 2007. Retrieved September 12, 2007. ^ AP, "Nike sees dollar signs in Woods' magical shot", MSNBC, April 13, 2005. Retrieved September 14, 2007. ^ "Tag Heuer's Innovative Creation Wins Prestigious Award" Archived September 9, 2007, at the Wayback Machine, best-watch.net Watch News, January 31, 2007. Retrieved September 11, 2007. ^ Woods, Tiger; Rothman, Wilson (September 26, 2004). "Q&A with Tiger Woods". Time. Retrieved July 8, 2009. ^ Surette, Tim (February 2, 2006). "Tiger Woods to play another six with EA". GameSpot. Retrieved July 8, 2009. ^ Abelson, Jenn (February 5, 2007). "Gillette lands a trio of star endorsers". Boston Globe. Retrieved October 17, 2007. ^ "Gatorade Unveils a Taste of Tiger". The Washington Post. October 17, 2007. Retrieved June 25, 2009. ^ "Gatorade confirms it is dropping Tiger Woods drink, but decided to before fateful car wreck". Chicago Tribune. Associated Press. December 9, 2009. Archived from the original on December 13, 2009. Retrieved December 9, 2009. ^ "Sports nutrition firm Fuse Science signs on as sponsor of Woods' bag". PGA of America. Associated Press. Retrieved October 25, 2012. ^ "Palmer v. Gotta Have It Golf Collectibles, Inc". 106 F.Supp.2d 1289 (2000) United States District Court, S.D. Florida. June 22, 2000. Retrieved May 24, 2014. Batterman, L. Robert; Cardozo, Michael; Freeman, Robert E.; Ganz, Howard L.; Katz, Wayne D.; Leccese, Joseph M. (May 17, 2014). "Tiger Woods Misses the Cut in Golf Memorabilia Dispute". National Law Review. Proskauer Rose LLP. Retrieved May 24, 2014. ^ McEwan, Michael (August 4, 2016). "Tiger Woods to seek new equipment partner". bunkered. ^ Dennett, Craig (August 3, 2016). "Nike to exit golf equipment industry". bunkered. ^ Harig, Bob (January 25, 2017). "Tiger Woods' move to TaylorMade". ESPN. ^ Sobel, Jason (January 25, 2017). "Tiger adds Cameron back into bag". ESPN. ^ Rovell, Darren (December 1, 2016). "Tiger Woods picks up Monster Energy". ABC News. ^ a b "Divorce decree" (PDF). August 23, 2010. Archived (PDF) from the original on May 17, 2014. Retrieved September 28, 2010. ^ Sounes, Howard (2004). The Wicked Game: Arnold Palmer, Jack Nicklaus, Tiger Woods, and the Story of Modern Golf. Harper Collins. pp. 120–121, 293. ISBN 0-06-051386-1. ^ Freedman, Jonah (2007). "The Fortunate 50". Sports Illustrated. Retrieved May 20, 2008. ^ Sirak, Ron (February 2008). "The Golf Digest 50". Golf Digest. Retrieved January 11, 2007. "Report: Tiger richest athlete in history". ESPN. October 2, 2009. Retrieved October 2, 2009. Badenhausen, Kurt (October 1, 2009). "Woods is sports' first billion-dollar man". Forbes. Yahoo! Sports. Archived from the original on October 6, 2009. Retrieved October 2, 2009. ^ Miller, Matthew (May 6, 2009). "The Wealthiest Black Americans". Forbes. Retrieved December 17, 2009. ^ Forbes' list of world's highest-paid athletes, Forbes. ^ "How Much Do The World's Top 10 Golfers Earn Per Shot?". November 20, 2017. ^ Lyon, Bill (August 16, 2000). "Woods bad for golf? There's an unplayable lie". The Philadelphia Inquirer. ^ "Tiger Woods Press Conference:The Open Championship". TigerWoods.com. ASAP Sports. July 12, 2005. Archived from the original on March 16, 2007. Retrieved May 13, 2007. Celizic, Mike (July 24, 2006). "Tiger is greatest closer ever". MSNBC. Retrieved August 12, 2007. Maginnes, John (August 12, 2007). "Goliath will surely fall one day. Or will he?". PGA Tour. Retrieved August 12, 2007. "Cabrera wins devilish battle at U.S. Open". ESPN. Associated Press. June 20, 2007. Retrieved August 12, 2007. ^ Harig, Bob (May 13, 2013). "Tiger Woods shows off his command". ESPN. Retrieved May 15, 2013. Romine, Brentley (May 12, 2013). "5 Things: Woods captures fourth Tour title in '13". Golfweek. Retrieved May 15, 2013. "Highlights: How Dufner won the 95th PGA Champ". Golf Channel. August 11, 2013. ^ Farrell, Andy (July 24, 2000). "Woods moves majestically to grand slam". The Independent. Retrieved May 20, 2009. ^ "Career Money Leaders". PGA Tour. Retrieved April 16, 2019. ^ "Guinness World Records online registry, the result of the linked search will display higher number of records, however many of those displayed contain the name of Usain Bolt in the description of the record but don't belong to him". Guinness World Records. Archived from the original on April 16, 2018. Retrieved March 18, 2018. "Woods threatens all records at the Masters". Canadian Online Explorer. Associated Press. April 12, 1997. Archived from the original on March 30, 2005. Retrieved August 6, 2007. "Tiger had more than just length in annihilating Augusta". Sports Illustrated. Associated Press. April 14, 1997. Retrieved June 20, 2009. ^ Polinski, Cara (July 8, 2003). "True Temper Wins Again!". The Wire. Archived from the original on September 27, 2007. Retrieved August 6, 2007. "Woods, Mickelson clear the air, put spat behind them". ESPN. February 13, 2003. Retrieved August 6, 2007. "Phil Mickelson clarifies Tiger comments". Golf Today. Retrieved August 6, 2007. ^ "Case Study: Tiger Woods". Linkage Incorporated. Archived from the original on October 15, 2006. Retrieved June 24, 2009. ^ "When Par isn't good enough". APMP.org. Archived from the original on July 20, 2008. Retrieved May 12, 2007. ^ Bradley, Ed (September 3, 2006). "Tiger Woods Up Close And Personal". CBS News. Retrieved May 13, 2007. ^ Harmon, Butch (2006). The Pro: Lessons About Golf and Life from My Father, Claude Harmon, Sr. Three Rivers Press. ISBN 0-307-33804-5. ^ Rosaforte, Tim (May 10, 2010). "Haney Resigns; Who Will Be Next?". Golf Digest. ^ "Canadian Swing Coach Foley Helping Tiger at PGA Championship". Canadian Press. August 10, 2010. Retrieved August 10, 2010. ^ "Woods Dismisses His Caddie Cowan". The New York Times. March 9, 1999. Retrieved May 13, 2007. ^ "Tiger's Caddie Reflects on "Defining" Moment at Medinah". Golf Channel. Associated Press. August 8, 2006. Retrieved May 13, 2007. ^ Porter, Kyle. "Steve Williams tells the story about how Tiger Woods fired him". CBS Sports. ^ "Tiger Woods hires caddie Joe LaCava". ESPN. Associated Press. September 27, 2011. Retrieved July 23, 2012. ^ "Winner's Bag: Tiger Woods, Tour Championship". PGA Tour. ^ Wall, Jonathan (November 29, 2016). "Tiger to debut TW '17 shoe at Hero World Challenge". PGA Tour. ^ Cannizzaro, Mark (August 29, 2007). "Tiger Pitch Ad-Nauseam". New York Post. Archived from the original on December 26, 2007. Retrieved June 24, 2009. ^ "Tiger WITB 2017". GolfWRX. November 30, 2016. ^ "Tiger Woods' Putter Headcover". "Mattingly Expected to Retire After Sitting Out 1996 Season". The Los Angeles Times. January 22, 1997. Brennan, Patricia (April 13, 1997). "The Changing Face of Golf; A CBS Profile of the Hottest Guy on the Links". The Washington Post. ^ a b c "With Clinton at his side, Woods opens his learning center". GolfWeb Wire Services. February 10, 2006. Archived from the original on May 25, 2011. Retrieved January 20, 2011. ^ "Programs: TWLC: Junior Golf Team". Tiger Woods Foundation. Archived from the original on January 28, 2012. Retrieved January 20, 2012. ^ a b c d Harig, Bob (December 1, 2010). "Tiger Woods' foundation suffered greatly". ESPN. Retrieved January 20, 2011. ^ Lamport-Stokes, Mark (December 17, 2007). "Tiger eyes legacy away from sport". Reuters. Retrieved January 20, 2011. ^ a b "Tiger visits new TWLC Florida campus in Stuart". Tiger Woods Foundation. December 9, 2011. Archived from the original on January 7, 2012. Retrieved January 20, 2012. ^ "Events: Tiger Woods Invitational". Tiger Woods Foundation. Archived from the original on January 26, 2012. Retrieved January 20, 2012. "The fifth annual Block Party raises more than $500,000". Tiger Woods Foundation. October 18, 2009. Archived from the original on May 13, 2012. Retrieved January 20, 2012. "Tiger Woods Speaks About Injury, PGA Tour Athlets During Jam". GolfLasVegasNow.com. April 30, 2011. Archived from the original on May 3, 2011. Retrieved January 20, 2011. Carpenter, Eric (December 14, 2009). "Tiger Woods takes hiatus from OC foundation". The Orange County Register. Retrieved January 20, 2011. ^ Soltau, Mark (November 6, 2006). "Tiger Woods' next step: Design golf courses". ESPN. Retrieved January 20, 2011. ^ a b Wolfensberger, Marc (December 3, 2006). "Tiger Woods Will Design First Golf Course in Dubai". Bloomberg. Retrieved January 20, 2011. ^ Fattah, Zainab (February 1, 2010). "Tiger Woods's Dubai Golf Resort Will Be Completed, Builder Says". Bloomberg. Retrieved January 20, 2011. ^ a b c d e Sullivan, Paul (April 2, 2011). "For Tiger Woods, a Golf Course Design Business Is in the Rough". The New York Times. Retrieved June 19, 2013. ^ McGinley, Shane (July 9, 2013). "Dubai Holding 'dissolves' Tiger Woods partnership". arabianbusiness.com. ITP Publishing Group. ^ "Tiger to design his first U.S. course". ESPN. Associated Press. Retrieved August 15, 2007. ^ Louis, Brian; Taub, Daniel (October 7, 2008). "Tiger Woods and Flagship to Build Mexico Golf Resort". Bloomberg. Retrieved January 5, 2010. ^ "New deal includes instruction, Web pieces". ESPN. Associated Press. May 8, 2002. Retrieved June 18, 2008. ^ Snider, Mike (October 9, 2001). "Tiger Woods joins the club of golf book authors". USA Today. Retrieved June 20, 2008. ^ Stachura, Mike (March 14, 2017). "Tiger Woods' new book is a vivid but cautious reflection on his landmark win". Golf Digest. Retrieved March 19, 2017. ^ "Five things you didn't know about Elin Nordegren". CNN. December 4, 2009. Retrieved December 15, 2009. ^ "Woods ties the knot". BBC Sport. October 6, 2004. Retrieved August 23, 2010. ^ a b "Tiger Woods buys $40 million estate". The New York Times. January 1, 2006. Retrieved August 23, 2010. ^ White, Joseph (July 3, 2007). "Woods played U.S. Open while wife was in hospital". USA Today. Associated Press. Retrieved December 2, 2009. ^ "Tiger becomes dad for second time". ESPN. Associated Press. February 9, 2009. Retrieved February 9, 2009. ^ "World Exclusive: Woman at Center of Tiger Woods Cheating Scandal Exposed!!". National Enquirer. November 28, 2008. Retrieved May 29, 2017. ^ a b "Tiger Woods admits "transgressions," apologizes". Reuters. December 2, 2009. Retrieved January 23, 2012. ^ a b DiMeglio, Steve (December 3, 2009). "Woods crash did $3,200 damage to hydrant, tree". USA Today. Retrieved January 23, 2012. ^ Corrigan, James (November 28, 2009). "Tiger injured in late-night car accident". The Independent. Retrieved January 23, 2012. "Tiger Woods issues statement on crash". USA Today. Associated Press. November 30, 2009. Retrieved January 23, 2012. Woods, Tiger (November 29, 2009). "Statement from Tiger Woods". TigerWoods.com. Archived from the original on February 11, 2012. Retrieved January 23, 2012. ^ "Tiger Woods Cancels Tourney Appearance". CBS News. November 30, 2009. Retrieved September 21, 2010. ^ "Hear Tiger Panic to Mistress: "My Wife May Be Calling You"". Us Weekly. December 2, 2009. Retrieved April 8, 2016. ^ Woods, Tiger (December 2, 2009). "Tiger comments on current events". TigerWoods.com. Archived from the original on December 3, 2009. Retrieved December 4, 2009. "GM ends car loans for Tiger Woods". BBC News. London. January 13, 2010. Retrieved January 13, 2010. "Tiger Woods loses Gatorade sponsorship". BBC News. February 27, 2010. Retrieved September 5, 2010. ^ Golf Digest, February 2010. ^ Klayman, Ben (January 4, 2010). "EA Sports moves forward with Tiger game rollout". Reuters. Retrieved January 23, 2012. ^ Goldiner, Dave (December 29, 2012). "Tiger Woods' mistress scandal costs shareholders of sponsors like Nike, Gatorade $12 billion". New York Daily News. ^ "Transcript: Tiger's public statement". Web.tigerwoods.com. ASAP Sports. February 19, 2010. Archived from the original on September 20, 2010. Retrieved September 5, 2010. ^ Rude, Jeff (March 17, 2010). "Woods' return shows he's ready to win". Fox Sports. Retrieved March 23, 2010. ^ Helling, Steve (August 23, 2010). "Tiger Woods and Elin Nordegren's Divorce Is Final". People. Retrieved September 5, 2010. "Booking Blotter". Palm Beach County Sheriff's Office. May 29, 2017. Alexander, Harriet; Curtis, Ben (May 29, 2017). "Tiger Woods blames driving arrest on 'prescribed medications', not alcohol". The Telegraph. "Tiger Woods found asleep in car at time of arrest; no alcohol found in breath test". ESPN. May 30, 2017. ^ Bieler, Des (July 3, 2017). "Tiger Woods announces that he's completed a 'private intensive program'". Washington Post. ^ Winsor, Morgan (August 9, 2017). "Tiger Woods pleads not guilty to DUI charges". ABC News. ^ Greenlee, Will (August 10, 2017). "Tiger Woods to take part in DUI first-offender program – Videos". USA Today. ^ Anderson, Curt; Spencer , Terry (October 27, 2017). "Tiger Woods found guilty of reckless driving". Chicago Tribune. Associated Press. ^ "Tiger Woods makes emotional apology for infidelity". BBC News. London. February 19, 2010. Retrieved February 26, 2010. ^ Wright, Robert (July 24, 2000). "Gandhi and Tiger Woods". Slate. Retrieved August 13, 2007. ^ "Tiger Woods Returns to Buddhism". ISKCON News. February 20, 2010. Archived from the original on April 12, 2010. Retrieved March 11, 2010. ^ Abcarian, Robin (December 13, 2009). "How did Tiger keep his secrets?". Los Angeles Times. Retrieved December 13, 2009. "Tiger to speak at Lincoln Memorial". ESPN. Associated Press. January 16, 2009. Retrieved January 20, 2009. "Tiger Woods gives speech at Obama inauguration". Golf Today. January 21, 2009. Retrieved May 4, 2009. ^ Montopoli, Brian (April 23, 2009). "Tiger Woods in the White House". CBS News. Retrieved May 3, 2009. ^ Porter, Kyle (November 24, 2017). "President Trump plays post-Thanksgiving golf with Tiger Woods and Dustin Johnson". CBS News. Retrieved November 25, 2017. ^ "Woods, Vonn end relationship". PGA Tour. Associated Press. May 3, 2015. ^ Christie, Sam (April 7, 2018). "Ex-golfriend: Who is Kristin Smith? Tiger Woods' ex-girlfriend, stylist and former wife of Dallas Cowboys star Gerald Sensabaugh". The Sun. Retrieved April 17, 2019. ^ a b Kavanagh, Joanne (April 17, 2019). "Tiger's Girl? : Who is Tiger Woods girlfriend Erica Herman and how long has Masters 2019 champion been with the restaurant manager?". The Sun. Retrieved April 17, 2019.